Amazingly detailed and gracefully beautiful, Alasia's tempera-on-papyrus paintings meld the stunning style of ancient Egyptian art with the mysteries of the Tarot. To shape the interpretations, Alasia relied on the conceptions of Jean-Baptiste Pitois, who linked the Tarot tradition to the legendary Book of Thoth. 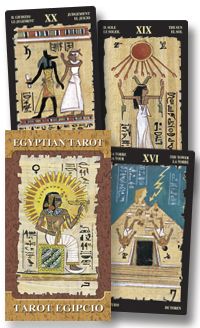 Replete with ancient and exotic symbols, these cards speak to the soul. Inlcudes booklet.